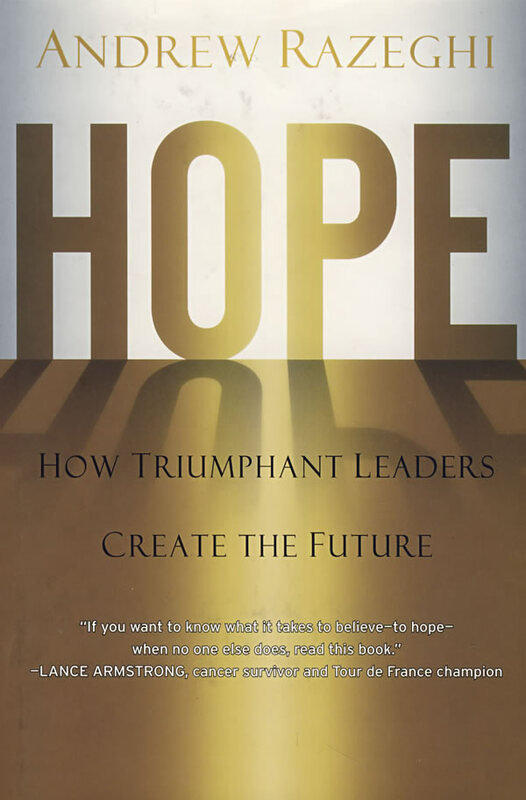 书籍简介: Leaders personify hope,\\\\\\\\\\\\\\\\\\\\\\\\\\\\\\\\\\\\\\\\\\\\\\\\\\\\\\\\\\\\\\\\\\\\\\\\\\\\\\\\\\\\\\\\" Razeghi claims, not by trusting in luck but by demonstrating their preparedness to seize opportunities for success even when faced with setbacks. His exploration of the power of positive thinking strives for universality, touching base with spiritual leaders like Deepak Chopra and businessmen like Charles Schwab, as well as drawing upon some of his own personal experiences as a management consultant and, at one point, an attempt at inspirational poetry. Razeghi has a friendly, engaging manner, and some of his stories, such as one about the experiences of an astronaut who remained calm enough to put out a fire on a space station, can be inspiring. However, his mixture of psychology, cognitive science and self-help advice turns out to be a superficial rehash of well-worn advice. The methods of \\\\\\\\\\\\\\\\\\\\\\\\\\\\\\\\\\\\\\\\\\\\\\\\\\\\\\\\\\\\\\\\\\\\\\\\\\\\\\\\\\\\\\\\"belief management\\\\\\\\\\\\\\\\\\\\\\\\\\\\\\\\\\\\\\\\\\\\\\\\\\\\\\\\\\\\\\\\\\\\\\\\\\\\\\\\\\\\\\\\" he discusses, such as creating personal mantras and motivational narratives, are old hat. Buzzwords abound: improvising through uncertainty becomes \\\\\\\\\\\\\\\\\\\\\\\\\\\\\\\\\\\\\\\\\\\\\\\\\\\\\\\\\\\\\\\\\\\\\\\\\\\\\\\\\\\\\\\\"wayfinding,\\\\\\\\\\\\\\\\\\\\\\\\\\\\\\\\\\\\\\\\\\\\\\\\\\\\\\\\\\\\\\\\\\\\\\\\\\\\\\\\\\\\\\\\" for example, while the contemplation of one's own mortality is reduced to \\\\\\\\\\\\\\\\\\\\\\\\\\\\\\\\\\\\\\\\\\\\\\\\\\\\\\\\\\\\\\\\\\\\\\\\\\\\\\\\\\\\\\\\"flatlining.\\\\\\\\\\\\\\\\\\\\\\\\\\\\\\\\\\\\\\\\\\\\\\\\\\\\\\\\\\\\\\\\\\\\\\\\\\\\\\\\\\\\\\\\" Anyone who has already given serious consideration to personal and professional motivation is sure to find most of this material too familiar to be truly revealing.